On August 22nd, Chiba City authorities organised a sports event called “Oto-Spo” (Short for Otona no Sportsu – Sports for Adults). It was held in a huge outdoor sports complex in Soga, home of JEF United football team, and the idea was to give local people the chance to try out sports that they might not otherwise get the chance to play. 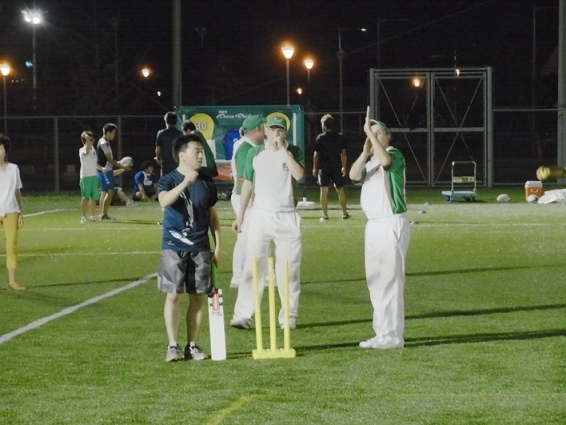 There was an interesting mix on offer – football, rubgy, basketball, American football, volleyball and…..what’s this……..cricket! Ishimoto-san of JCA Chiba arranged for the Chiba Sharks to represent our fine sport to the unwitting masses of suburban Japan. And they loved it. For the Sharks, Kris Bayne, Charles Steinhardt, Chris Thurgate, Dave Lollback and Anton Lloyd-Williams made the journey down to Soga for a 6 p.m. rendez-vous. 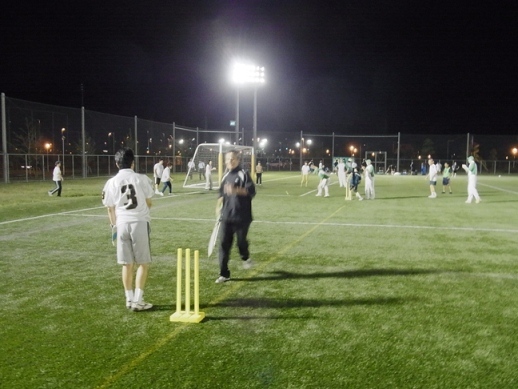 We were to have 30 minute sessions with four different groups of punters between 7 and 9 pm. Kris was boss for the evening and worked out a show – 5 mins intro, 5 mins watching the stars of the Chiba Sharks show the game at its most skillful and graceful and then 20 minutes of free for all bowling and batting with the odd bit of advice such as getting forward to a good length ball and which way round to hold the bat etc. Well, over the course of 2 hours we had around 60 or so brave souls try their arm at our game. Many were intrigued by the idiosyncrasies that we take for granted such as not having to run, holding on to the bat and catching without a glove. It has to be said though that some looked very useful indeed. Some of the catching was inspired, the batting showed evidence of a very good eye and the enthusiasm of everyone was particularly infectious. Charles, when bowling, got some of his own medicine by getting slogged out to cow corner a few times but Anton took his first hat-trick! The joy was short lived however as he was subsequently flayed around the park like a rented mule. Kris beautifully demonstrated the art of edging behind while Dave showed that running with him between the wickets can be fun as well as fearful. Chris T played the part of social dandy as he does so well and Ishimoto-san kept the whole show together. 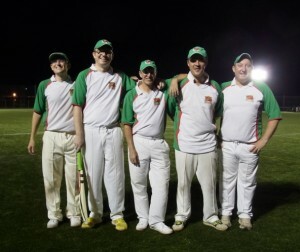 All in all we gave a pretty good account of ourselves and of cricket in general. While it might look like an odd game from a distance, we showed that when you get involved there is a lot of fun to be had. Players from other sports came over to join in and it was illuminating to see their reaction. One gent, a strapping American Football player from the US seemed genuinely worried for his safety as Charles came in to bowl!!! Imagine the terror Sancheti could invoke down there! Anyway, there’ll be more opportunities for this kind of thing in the future. 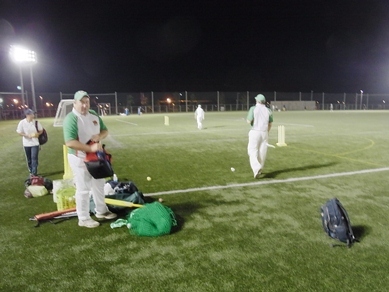 It’s good that we are sowing a few cricketing seeds in our locale and getting cricket into the mind-frame of the sporting authorities in Chiba and the local population as well. Many thanks to all the Sharks who came (especially Dave who came after work!) and to Ishimoto-san for organising the whole thing.